for conducting seismic refraction, reflection, shear wave, and multichannel analysis of surface waves MASW surveys. Seismographs, geophones, cables, and sources come in many different configurations. This is one reason people rent seismic equipment. Cables come in different lengths with different types of connectors. Geophones are designed to respond to a specific range of frequencies. Seismographs are commonly designed with 24 channels or 48 channels. If you are looking for seismic rental equipment, such as, cables, geophones, and seismographs (e.g., a Geode system by Geometrics) try K. D. Jones Instruments. They also have variety of equipment for engineering geophysics or near surface geophysical surveys. when compared to oil, gas, and deep exploration surveys. Higher resolution geophysical equipment that is used during a shallow engineering geophysical survey may not respond well to the seismic energy produced for greater depths of penetration. Some examples are provided below. While 10 Hz or 25 Hz geophones are rented for seismic refraction and shear-wave surveys, 40 Hz geophones may yield more detail for a shallow seismic reflection survey. MASW and shear-wave surveys are often conducted with 4.5 or 10 Hz geophones. Downhole shear-wave surveys commonly use triaxial geophones mounted in a borehole tool (e.g. Geostuff Wall-Lock Borehole Geophones). Borehole geophysical surveys require special equipment for clamping the geophone to the borehole. For help today, fill out SeismicRental.Com’s form. Scroll down to skip the form or go to the bottom of this page and leave a comment for someone to help you find an answer about seismic applications. We will respond. come in different lengths and types of connectors. You need to match the cable connector to the seismograph or roll box. 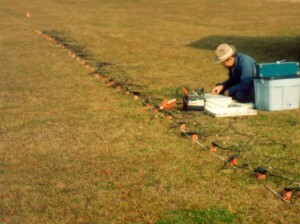 Depending on the type of seismograph used, a roll box may be needed to select a group of geophones along the geophone array. Geophones have different types of connectors or plugs. Two common types of plugs are, Kooter and Mueller Clips. Seismic cables come with these two types of geophone takeouts and are equally spaced. The distance between takeout depends on the type of geophysical seismic survey that is being conducted. Some seismic cables come with 12 geophone connections per cable and some come with 24 geophone connections per cable. Cables with more than 24 geophone takeouts often become to heavy and difficult to handle. range from a hammer, weight drop, explosion (shot gun), or variable frequency vibration unit. A sledge hammer often works well for shallow engineering geophysics. A sledge hammer and strike plate may provide enough energy for a shallow reflection survey to reach 100’s of feet of penetration or enough energy for a seismic refraction survey to reach 100 feet deep. Greater depths of investigation can require larger energy sources, such as, a weigh drop. The depth of penetration with a specific source is usually site specific. Contact Seismic Rental.com for someone to assist with determining what seismic rental equipment you may be for your geophysical survey or follow this link to find out more about engineering geophysics. I have a similar data request to Bruce. I would like to be able to determine the depth to bedrock in several narrow canyons and gulches. The gold bearing payzone is located at the bedrock contact and the old timers gave up when the gravel got too depth, the more recent miners only draglined or hydraulically sluiced some of these areas. from my research it looks like Seismic Refraction will work to a depth of 100 feet and Reflection is the way to go beyond that. This gulches start off (at the head) being only a few feet across and spreading out to 100′, 200′ and wider farther downstream with increasing gravel depths. What sort of geophone spacing would you recommend for a 25 to 50′ wide gulch/canyon. What type of model of equipment would be suited for this type of investigation. You have done some research on geophysics. If you have the space and a good energy source, seismic refraction can reach depths that are much greater than 100 feet. Without having detailed knowledge about the above ground conditions, multi-channel analysis of surface waves MASW or seismic reflection may yield desirable results. If the gulches are narrow and have steep sides, there may not be enough space to conduct a seismic refraction or a MASW survey. You may have luck doing refraction or MASE along the long axis of the gulch but that would not provide as much information about the bedrock surface as if the surveys were conducted perpendicular. Seismic reflection works well for depths less than 100 feet but it is generally too time consuming and tedious, especially if other geophysical methods may work. With all the methods, except MASW, the location of the water table may play a crucial role. Geonics EM-31 or ground penetrating radar GPR systems may be a good choice where the gulch is less than 50 ft wide and the bedrock is shallow. For areas with more space, a Geonics EM-34 may give you an idea where the overburden thickness is the greatest. GPR will provide the greatest resolution if the signal can reach the top of rock and reflect back. For seismic methods and EM methods, the soils need to be fairly homogeneous and it would be important to know about how thick the saturated zone is. If you decide to use seismic reflection methods, you may get away with using the common offset approach. The common offset seismic reflection method is more or less the same as GPR but uses seismic energy instead of electromagnetic pulses. A seismic reflection common depth point method CDP may also yield desirable results but there is more computer processing required. Is there a direct relationship between a geophone’s reading in mV and the particle displacement in micrometers? Does this depend on the frequency of the geophone or any other geophone parameters? Interesting seismic equipment question with detail. I am under the impression you have a background in geophysics or seismic methods. A geophone is intended to quantify the particle motion of seismic energy. During a common seismic survey, the energy passes through the earth as a wave. Waves are vector quantities that have amplitude and frequency. Often, the amplitude is measured in mV with a seismograph using a geophone. A calibrated seismic system, like a ground vibration monitor, yields particle velocity by measuring the displacement in mV and converting it in to distance over a period of time. The units of distance are often shown in inches or meters, but there is no reason why you could not use micrometers. There are geophones designed for specific types of geophysical investigations. Choosing the right geophone for the investigation often includes deciding what frequency response you are interested in capturing and the dampening characteristics of the geophone. I am proposing to do a seismic refraction survey for overburden thickness, about 60 ft. Can I do it with a 12 channel seismograph? In my opinion, seismic surveys can not have too many geophones. There are certainly cases where this is not true. A well designed generalized reciprocal survey with many shot points off the ends and along a 12 channel geophone array would work; however, 24 or 48 channels often provide peace of mind for little extra cost. I like the extra channels because I have more choices. With extra channels you can decide to expand the line for greater coverage or keep the geophone spacing close for redundancy. The extra traces can help your confidence in your geophysical interpretation. Sometimes it can be difficult to make good first break picks with fewer geophones. The results of my refraction survey are not right. What you think? What is the geology like? Where is the water table or saturated zone? About 40 ft of sand on top of bedrock. It is saturated about 20 to 30 feet down. You may have a situation where the unit thickness of the saturated sand is not great enough to produce a good refraction to analyze or is coming in late. When you look at your first break picks for the seismic refraction records do you have three sloping lines? You should expect to see three sloping lines, one for each refraction and the direct arrival. The first sloping line is from the direct arrivals, the second line would be for the contact between the unsaturated and saturated zones, and the third refraction would be for the saturated sandstone and bedrock interface. Maybe three lines. Hard to tell. Will a Geometrics Geode measure ground vibration? A Geometrics Geode could be used for measuring ground vibration; however, it is not intended for ground vibration monitoring. The Geode is a seismograph that is typically used for seismic refraction, seismic reflection, seismic shear wave, and multi-channel analysis of surface waves MASW surveys. Measuring ground vibration in a borehole using a GeoStuff borehole geophone is one unique example of using a Geode seismograph for quantifying ground vibration. In contrast, seismographs designed specifically for ground vibration monitoring are highly sensitive and are calibrated. The ground vibration monitoring system is often self contained and has a triaxial geophone, which is matched to a specific seismograph. The Minimate Plus and Blastmate are two units manufactured by Instantel that are designed for this specific application. For determining particle velocities recorded with a Geometrics Geode, the recorded seismic data needs to be converted to ASCII format using Geometrics software. The data can then be adjusted for the response function of the geophone (which is a general purpose response curve for the geophone not a current calibration). Need seismic reflection equipment to run two 150 foot lines and three 75 foot lines. The simpler the better. Please advise of equipment options and availability. Wayne, I am posting a follow up response summarizing our discussion on engineering geophysical methods. As I understand it, geologically you have 10 to 20 feet of sandy dry soil on top of a competent bedrock sandstone. However, within the soil there are sporadic boulders (measured in feet) or boulder float. The survey area is on a side slope where an engineered structure is to be placed. Your goal is to geophysically characterize the overburden thickness because previous depths to rock were based on the depth of refusal from a soil boring, which may be on top of a boulder. In summary, the target depth is likely too shallow for seismic reflection methods. A seismic refraction survey may work well if there is a solid bedrock surface and there are not too many boulders. The more boulders you have the less confident one would be that seismic refraction or other geophysical methods may work. Ground penetrating radar GPR may have the ability to image the boulders and the sandstone surface. A computer processed 3-D GPR survey acquired with closely spaced perpendicular lines can create plan view plots for increasing depths of penetration. Electrical resistivity methods, such as, multi-electrode MER or capacitance coupled resistivity (Geometrics OhmMapper) may yield desirable results if there is a detectable electrical contrast between the soil and the sandstone. Depending on site conditions, these two electrical resistivity methods can yield fairly detailed cross-sections and may be less sensitive to the boulders than the refraction methods. Electromagnetic methods ( Geonics EM31) may be a good choice if the soils are more clay rich or more electrically conductive than the sandstone. While the GPR would prefer soils lacking electrically conductive clay minerals or moisture, the electrical resistivity and electromagnetic surveys would have a greater detectable electrical contrast between the soils and the sandstone bedrock if the soils were clay rich or wet. Now days it is fairly simple to collect a large volume of data using engineering geophysical survey methods. Most geophysical equipment is digital and requires a working knowledge of the software. Nonetheless, almost anyone can operate the geophysical equipment. But survey design, processing, and interpretation of an engineering project may require the assistance of a geophysicist, engineer, geologist, or other professional with experience in geophysical applications. Do metal security fences affect MASW data? In general,unless you need to do a seismic survey next to a fence, move it over. A seismic line that is perpendicular to a fence is much less likely to have issues with the response but logistically it can take much longer to do the survey. Getting around a fence line can use up a lot of field time. Geophones that are placed next to fence posts and next to fencing that is coupled to the ground has a much greater chance of being an issue. It is likely best to offset any seismic survey from a rigid fence line. It is more difficult for seismic energy to be transmitted along a loosely strung fence. Seismic energy passed along an unwanted path can complicate the recorded seismic response. An unexpected response can lead to undesirable results. Can I identify the liquid in a buried drum with geophysics? Vince, engineering geophysical seismic survey methods are not known for identifying liquids. Unlike electrical resistivity or electromagnetic geophysical methods, seismic refraction, seismic reflection, MASW, and/or shear wave surveys are not known for locating drums or for identifying what has leaked out of them. Electrical resistivity and electromagnetic methods are able to map contaminate plumes but are not able to directly identify what the contamination is. I need to rent seismic equipment that will allow us to perform seismic survey of shallow placer gold area. What equipment do I require? Hardware & software. Does the software run on a PC or a CRay? I need to rent equipment to perform shallow seismic surveys at placer gold claim. What would you recommend? Hardware & software (does the software run on a laptop?). Located in central British Columbia. A seismic survey is not the same as a metal detector. I realize that you are looking to find “the gold,” but seismic methods are more often used to characterize the geology in a way to better point you towards where “the gold” may be found. So, we need to know a little more about the geology you are looking to characterize. What can you tell me about the soils, rock, and geology at your site. The seismic rental equipment pool has a Geometrics Geode, geophones, cables, and a couple software packages. The software runs on a laptop and is somewhat dependent on what type of seismic survey you will want to conduct (seismic refraction, seismic reflection, MASW, or other).